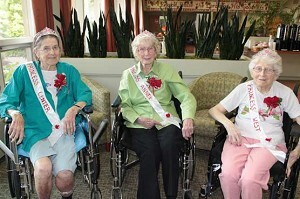 BEAVERTON — Portland Rose Festival Princess Clara Cannon visited Maryville last month to crown the retirement and rehabilitation community’s 2015 Rose Queen. The 2015 Maryville Rose Princesses were Val Koven, 91; Dimi Todd, 100; and Naomi Lewis, 92. In the end, the centenarian reigned. Todd had been named a queen before: of Marana Army Air Field in Arizona, where her husband, Bob, trained during World War II. Born in Portland in 1914, Todd was a fashion model who also worked as a secretary. Her husband, who died a decade ago, started a Portland packaging company. Cannon, who graduated June 6, was the first Rose Princess in the history of Valley Catholic School. Valley Catholic students became eligible to apply for the Rose Festival Court when the school moved into 4A athletics during the 2014-‘15 academic year. For more than 15 years, Maryville, on the Sisters of St. Mary of Oregon campus, has crowned princesses from different sections of the facility. Then comes voting by residents, families, staff and friends. Koven was born in Raymond, Wash. She studied at the University of Washington and eventually received a master’s degree in retailing from New York University. Lewis was born in Windham, Ohio. She earned a pilot’s license to accompany her husband when he piloted their small plane.